History of Gone with the Wind: Experiences of casting director in finding Scarlett. The producer David O. Selznick took more than two years to cast the role of Scarlett O’Hara for his 1939 film Gone With the Wind. 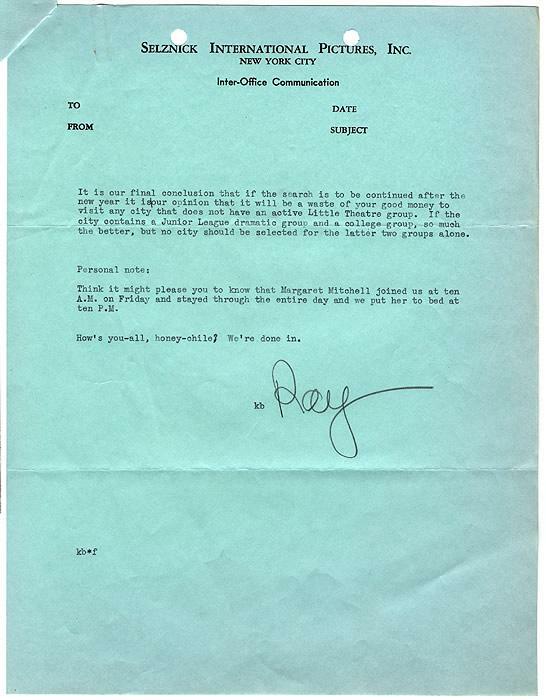 Within a new web exhibition about the making of the movie (“Producing Gone With the Wind”), the Harry Ransom Center has collected producers’ correspondence pertaining to this search, including this fed-up letter from a Selznick employee mired in the casting process. 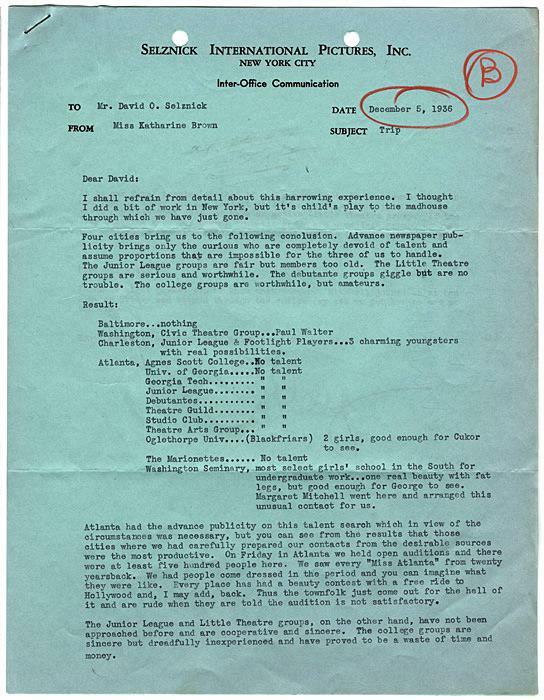 Selznick, the Ransom Center curators write, was taken with the idea of finding an unknown actress for the Scarlett role. “In doing so, he could hire someone relatively inexpensively and place her under contract so that she would be committed to his studio when she became a star,” they explain. This tactic was also good for publicity; the search conducted across the American South kept the Gone With the Wind movie at the forefront of people’s minds. Southern enthusiasm for the project foreshadowed the nostalgia for the antebellum period that the film would stoke. “We had people come dressed in the period and you can imagine what they were like,” Brown sighed. After a few years of looking, Selznick hired a relatively unknown British actress, Vivien Leigh—at which point he got plenty of outraged letters. Courtesy of the Harry Ransom Center.